On October 25, 2016, El Dorado County Sheriff’s deputies responded to the area of the El Dorado Hills Sports Club for a report of a vehicle burglary that had just occurred via window smash. An alert witness followed the suspect and provided EDSO with valuable suspect vehicle information as well as a direction of travel. The suspect violated numerous traffic laws while traveling from El Dorado County down to Sacramento County and fled from the witness. Area law enforcement agencies were made aware of what was transpiring and the fact that the suspect was fleeing towards Sacramento County. The California Highway Patrol located the suspect vehicle traveling westbound on Highway 50 in Sacramento near Watt Avenue. Upon initiating a traffic stop, the suspect vehicle rapidly turned into the parking lot of a motel near Stockton Boulevard. The fleeing suspect was arrested after he exited his vehicle and attempted to further flee on foot from CHP. The suspect was identified as Laronte Studesville, a 24 year old male with a listed address out of Antioch, CA. EDSO deputies and detectives responded to Sacramento and continued with the burglary investigation stemming from the El Dorado Hills Sports Club. Numerous items of stolen property were recovered from Studesville’s vehicle including credit cards, cash and a computer. Detectives traced some of the items to a second burglary which had occurred at the Palladio in Folsom just minutes prior to the El Dorado Hills Sports Club burglary. Detectives and deputies determined that Studesville’s vehicle’s license plates had been covered up with phony paper license plates and he was in possession of a punch tool and a screwdriver. 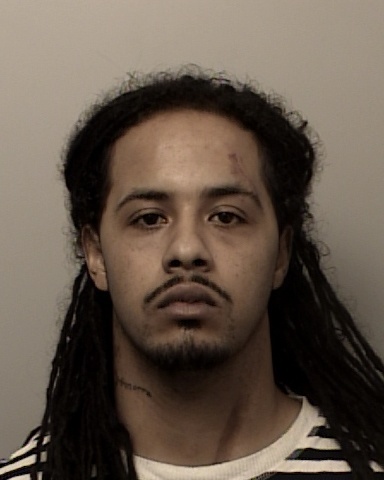 On October 25, 2016, Studesville was booked into the El Dorado County Jail in Placerville on numerous felony and misdemeanor charges: burglary, mail theft, ID theft, possession of burglary tools and possession of stolen property. Studesville was released on bail the same day. As of October 26, 2016, all of the recovered property identified as being stolen by Studesville on October 25, 2016, has been returned to its rightful owners.